Brew of The Day: PLDT myDSL’s Internet to Sawa TRANSFORMS my Internet experience from super slow to SUPER SPEED! PLDT myDSL’s Internet to Sawa TRANSFORMS my Internet experience from super slow to SUPER SPEED! I wish I had PLDT myDSL back when I was in college. I remember the days when I first started going online. That was like more than 10 years ago during my college years! Yes, those were the prehistoric ancient days of technology when I would weep, wail, and tear my hair out of frustration because of the super slow dial-up internet connection. I would buy internet prepaid cards that promised a lot of free hours--but all quite useless really when it comes to the crucial moment when you need to upload documents, download stuff, or email that very important and very large email file to your professor during finals. It would take almost forever to upload a pic or download a song. 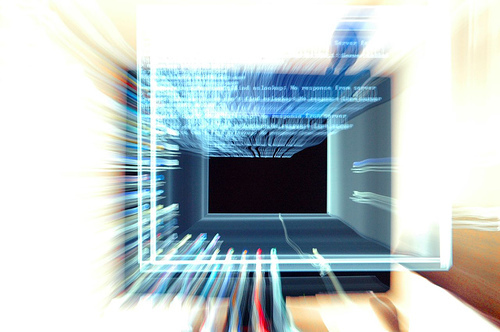 Worse of all is when it suddenly stalls and we lose the connection and you have to do it all over again! BUT thank GOD those days are long gone now. After a lot of convincing, my dad finally agreed that it would benefit the whole family to get PLDT myDSL. WOW! From super slow to SUPER SPEED! It really changed my whole internet experience! School papers, online streaming, downloading and uploading tons of picture was a breeze thanks to PLDT myDSL. Life became so much easier. Especially now as a blogger and article writer online. I need super speed and awesome internet service so that I can edit pictures, surf the net, write and post blogs and articles online without any interruptions. I used to be just your ordinary blogger, posting blogs just to express my inner self, thoughts, and ideas. But an awesome transformation took place when I became a "nuffnanger." Nuffnang opened a lot of new opportunities for me and helped my blog life and writing became more focus and clear. It was truly an extra ordinary transformation that I got from PLDT myDSL and Nuffnang. Now I have awesome news for all of you as well! 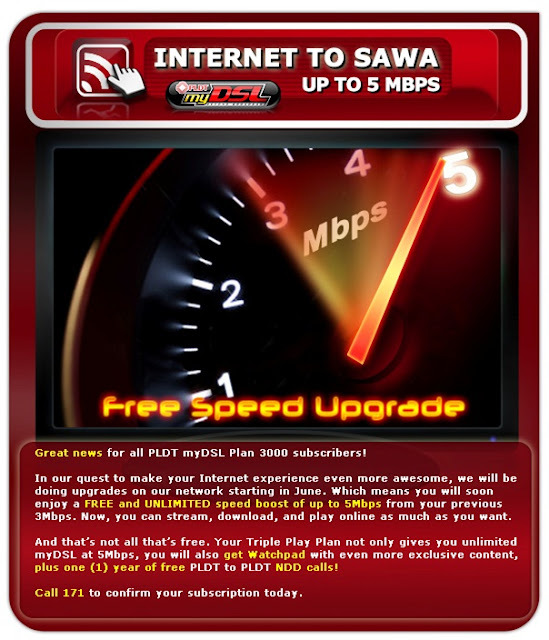 You can have an extra ordinary transformation from PLDT myDSL Internet to Sawa! PLDT myDSL Plan 3000 Subscribers will be enjoying a FREE and UNLIMITED speed boost from 3 mbps upto 5 mbps! That's crazy super speed for all your streaming, downloading, and online playing needs! PLUS you get WATCHPAD and one year of free PLDT to PLDT NDD Calls. So what are you waiting for? GET THAT SUPER SPEED! Visit www.myworldmydsl.com for more information or call 171 to confirm your subscription today! 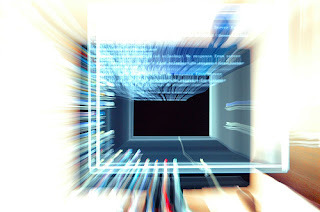 hehehe.. as of now we havent gone to that stage of super duper speed yet. but so glad that pldt is going to do a major boost to its system! yay tnks pldt!